They say you can't believe everything you read on the Internet. In that vein, I viewed the flurry of information that appeared regarding Sweden's prized fermented Baltic herring with no small amount of skepticism. As I consider myself to be generally open-minded and willing to try almost anything once, I went out and searched for some of my own. It wasn't easy, nor cheap, but I did manage to find a Swedish retailer willing to send two cans of surströmming to the United States, and they were shipped promptly. After boiling the potatoes and chopping the onions, I set everything up on the outside table. Trust me, you really want to be sure you only ever open a can of surströmming when you're outside, preferably when the neighbors are all on vacation for a while. Following custom, I submerged the can into a mixing bowl full of water and went at it with the opener. At first, I was amused to observe the escaping fermentation gasses and the bit of fish that poked around the edge of the can as I continued to open it. My amusement quickly gave way to horror as the smell reached me. I would describe the aroma of surströmming as a heady mixture of rotten fish, stagnant ocean water, low-rent house of ill repute on a Saturday night in midsummer, and rusty water. It was this last bit - the metallic smell - that really stuck with me, and continues to linger on my hands several hours and many scrubbings later. My daughter, never one to restrain her opinions on matters of taste, plugged her nose and ran crying into the house. From there, she watched me through the window with a horrified expression as I continued my taste test. Put simply, it was impossible to consider anything that smelled this bad as being edible. 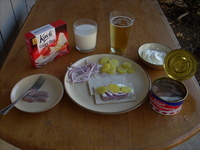 Nevertheless, I was convinced that perhaps there was a taste reward that justified this olfactory offense, and so I carried on preparing the surströmming in what has been described as the traditional manner - on crisp bread, topped with creme fraiche, red onions, and boiled potatoes. Honestly, it looked pretty good on the plate, and I can imagine such a dish being downright tasty. Putting aside one last lingering concern that I might perhaps be making a horrible mistake, I picked up the crisp bread and took a bite. Initial impressions? It was very salty, somewhat less so than anchovies but more so than smoked fish. Flavor was obviously very fishy, but not unpleasantly so. The mouth feel was soft and slightly rubbery, but overall not bad. Then that metallic-dead-fish-in-an-iron-barrel smell worked its way to the back of my palate, and any notion that this might be a pleasant experience dissolved in a torrent of autonomic nervous system responses. That was enough to convince me to abandon my experiment, and I spent the next five seconds or so drinking the pint of hard cider in the background of the picture. Surströmming is a truly amazing dish. To suggest that it's an acquired taste is akin to suggesting that self-immolation is not a pastime that just anyone would enjoy more than once. I cannot in good conscience recommend it to anyone. On that note, I have an extra tin of this stuff, and am willing to give it to anyone who promises not to use it inappropriately. Overall, an interesting idea, and now I can say I've tried it once. I am, however, thoroughly traumatized by the experience and will never, ever try this again. 0 stars, fully biohazardous. 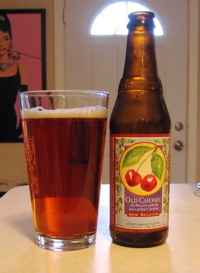 Upon pouring Old Cherry Ale from New Belgium Brewing, the scent of cherries was overpowering. I was taken aback, as I had not expected such a luscious boutique to fill the air just through pouring. However, once in the glass, I must say that the aroma of the beer has retreated rather incredibly, and now it smells vaguely of cherries and vaguely of that yeast characteristic of the New Belgium beer. It has an amber appearance, with a foamy head of medium-large bubbles that has good retention even if it doesn't leave much lacing. The color is not what I expected. I was thinking that a cherry beer would perhaps be either exceptionally dark, like a Flanders red, or very pale, like a raspberry wheat. It is neither. Clear, amber, and ale-like, one would be hard-pressed to tell the difference between this and a pale ale using eyeballs alone. This is a fruit beer, and I don't always get along with fruit beers. I was hesitant about tasting it, but it's really quite tasty. Smooth and malty up front, the cherry flavors blend nicely with the caramel sweetness of the malt and add a nice tartness that cuts through the sugars. As far as fruit beers go, this one is quite drinkable and perhaps even delicious. I think I may want a second, which is too bad, because I only brought home one of these. It is my understanding that Old Cherry Ale is primarily available in the New Belgium Folly Pack, so keep your eyes peeled! You may have to suffer through a few bottles of Fat Tire, but you'll be richly rewarded with some Mothership Wit, 1554 Black Ale, and Old Cherry Ale. Go find one! There are few breakfasts as dignified, quiet, and enjoyable as those including poached eggs. From the simple poached eggs-and-toast to the wonderfully complex eggs benedict, the elegance of this magnificent creation is obvious. Recently I entered into a contretemps with Mr Bertelsen regarding the proper way to poach an egg. He prefers to use an egg poacher , such as the one you see to the left, and contended that nobody wet poaching an egg could ever match its brilliant results. My position was the opposite: that no dry-poaching egg-cheater could ever come close to a well-made water-poached egg. We realized that we could not be the best judges of this particular contest, so we turned to the Breakfast Club and discovered the painfully obvious: I was right. So, I'm going to reveal to you all my method of making poached eggs. Perhaps somebody can improve on this, and if so, I'd love to hear it. I'm not really much of a cook at all, you see. Continue reading The Subtle Art of Poaching an Egg. Breweries have been releasing their winter seasonals, which are always very, very welcome. As the weather gets a bit nippy, there's nothing like a bold, strong beer to take an edge off the chill and get the blood pumping again. It was with great anticipation that I recently cracked open a big bottle of Bifröst Winter Ale from Elysian Brewing Company. There are a few things I expect from a winter ale. I expect a good level of alcohol heat, some darkness to its color, a good amount of body, and usually some sort of unique flavor. A lot of winter ales are spiced, and I'm a big fan of spiced beer. Bifröst started out a bit disappointing, in that it pours a very beautiful deep golden color, giving it the appearance of a very fine pale ale or IPA. It has a healthy, modest head that didn't linger longer than it needed to and left thick lacing on the side of the glass. It's a very beautiful beer, but it didn't match my expectations for the style. Its smell was rather faint, but notes of alcohol and honey were certainly present. My drinking partner for this event asked, "Why does sniffing this make my nose feel warm?" This beer weighs in at a healthy, but not overwhelming, 7.5% ABV, and it's not shy about letting you know. Finally, we drank the beer. It's an easy drinker, that's for sure. It lacks the fullness of flavor that I expect from a winter ale, but is loaded with a good dose of hops and possesses a thick, malty body that somehow does not manage to become the focal point of the beer. It's got a sharp, crisp flavor to it as well. Overall, while Bifröst may indeed be an enjoyable beer, I am going to continue my hunt for the ultimate winter ale. It deserves a solid three stars. Trout Slayer Ale from Big Sky Brewing Co.
One of my favorite things about Big Sky Brewing Co. is all of the great names they come up with for their brews. Moose Drool Brown Ale, Scape Goat Pale Ale, and Powder Hound Winter Ale are some of my favorites. I'm not very familiar with their beer, so when I got the opportunity to try Trout Slayer Ale, I took one look at its awesome label and dove right in. This is actually a pale wheat ale, which I don't think is a very common style in the States, and weighs in at 4.7% ABV, making it perhaps the weakest beer I've reviewed so far. It pours a pale gold color with a rather wimpy, big-bubbled head that left minimal lacing. It has a very yeasty, clean smell to it with hints of light fruit and hops. Nothing about its appearance belies that this is a wheat ale. In fact, until looking the beer up later, I didn't realize that wheat was used in its production at all. I found the flavor to be unremarkable. It's dry and clean, with hop notes about as weak as the maltiness. There's a pleasant effervescence to it and a bit of tartness at the back of the palate, but nothing really jumped out at me. I'd recommend this beer for hot summer days. Its light body and low alcohol means that one could quaff quite a bit of it while relaxing by the river with a fishing pole, which is perhaps entirely its purpose. Still, in these chilly fall months, I'd rather go for something with a bit more heat and a bit more color. I'm afraid I can only give this beer three stars. As I researched the Traquair House Brewery in preparation for writing this review, I realized something very disappointing: I'd been within thirty miles of this rather incredible brewery, and hadn't even known about it. I wasn't introduced to the Traquair line of delicious ales until relatively recently. While they tend to be rather spendy, they are certainly worth enjoying from time to time. Their House Ale is a Scotch ale, a variety that's rather difficult to find on our side of the pond. It weighs in at a hefty 7.2% ABV and pours a beautiful dark brown which shows tantalizing tints of ruby and sports a healthy tan head. One's nose is greeted by notes of dark fruit and a promise of malt, and it's difficult to keep in mind that this isn't a very cheap beer, and perhaps it shouldn't be guzzled with any urgency. Anyhow, I luckily managed to slow myself down while sampling this excellent beverage. It has a thick, rolling mouth feel and a really strong malt flavor reminiscent of caramel and fruit. The heat of the alcohol also makes itself known. At first, it seems as though this beer is a rather delicate brew, and it takes a few sips for the flavors to really emerge. When they do, they're worth it. This excellent beer is on the pricey side, but if you're interested in giving yourself a treat, it's hard to go wrong with a Traquair House Ale. It deserves its four stars. Letterfolding: A (Nearly) Lost Art. 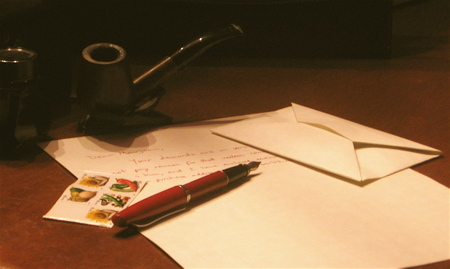 With a leisure-based lifestyle, we have the time to write a classy and beautiful piece of personal communication that can be treasured as a work of art by the recipient. It is important to choose good paper, a fine writing instrument, and quality ink, but the first thing someone is going to see is the envelope. An ugly 1000-for-a-dollar lick-seal envelope may be fine for the uncultured masses and for paying bills, but for a piece of art, we need something more. Letterfolding allows you to put a final personal touch on your communications, that bit of extra effort that says "I care" or perhaps, "I'm too cheap to buy an envelope." There are many classic letterfolds and you may wish to explore every one of them. My personal favorite is the fern letterfold, mainly for it's simplicity and classic look. For simple notes, and hand delivery, it is a great way to package your thoughts. For postal delivery, you'll want to use some wax and a seal, and/or tie it with a cord to ensure your letter remains unread by all but the intended recipient. You may wish to explore other more complex designs, or may prefer to fold a separate envelope. There are many letterfolds and envelopes to choose from, and I suggest you practice on something you can toss in your fireplace, prior to folding a letter you may have spent hours on. A great starting place and long term resource is "Envelope and Letterfolding". I wish you well in creating classier and more personal packaging for your future letter writing endeavors. I had the opportunity to taste a very strange beer recently. The Bayerisher Bahnhof Berliner-style Weisse is produced at the Gasthaus & Gosebrauerei in Leipzig, Germany. This happens to be the first beer of this particular style that I've tried, so I wasn't quite sure what to expect. The expert at the beer store told me that these are quite sour, so are typically flavored by adding various fruit syrups to them. A bit of research reveals that apparently Napoleon's troops began doing this during their occupation of the city. Well, I didn't have any flavored syrup to add, and the idea sounded pretty odd to me. After all, if I can handle The Dissident, nothing could be too sour. Upon pouring the beer, the most prevalent presence on the nose seemed to be pineapple and a few vague hints of sourness. Indeed, the beer proved to be a little sour up front, but I didn't find it to be remarkably so. In fact, though it had a pleasant effervescence to it, I cannot say that the beer impressed me a great deel. It had a fairly empty, boring body. I began to see why flavored syrups might be added to it. As the beer left the palate, lingering hints of lemonade or perhaps cider remained behind. It's hard to judge this beer really accurately without knowing more about this particular style, but at the moment I'd have to say that Berliner-style weisse is not my favorite variety of brew.